Halloween is definitely the time to go all out in on your baking. Especially when it comes to Halloween cupcakes. You can doctor up store bought cupcakes with candy designs or get more creative by baking your own cupcakes and piping fun icing designs on them. 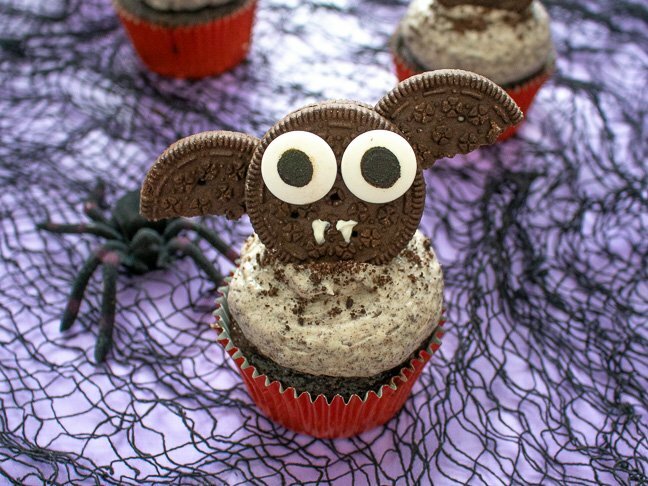 These Oreo bat Halloween cupcakes are perfectly cute and creepy but not be overly complicated or time consuming. 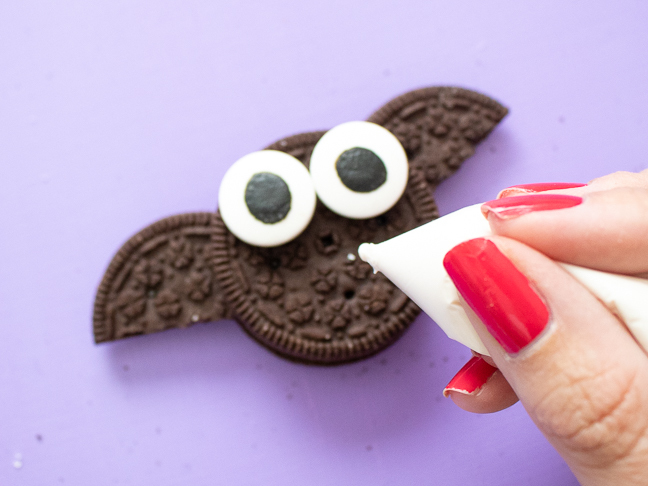 If you’re in charge of dessert for any upcoming holiday parties, these little Oreo bats are easy-to-assemble and make the ideal toppers for cookies & cream Halloween cupcakes. Kids and adults alike will love the classic cookies & cream flavors and the not-so-spooky bats on top. To make them scarier, try swapping the traditional candy eyes for spooky red ones. Step 1: Melt the chocolate or candy melts in a small bowl and move to a pastry bag or ziplock bag with the tip cut off. 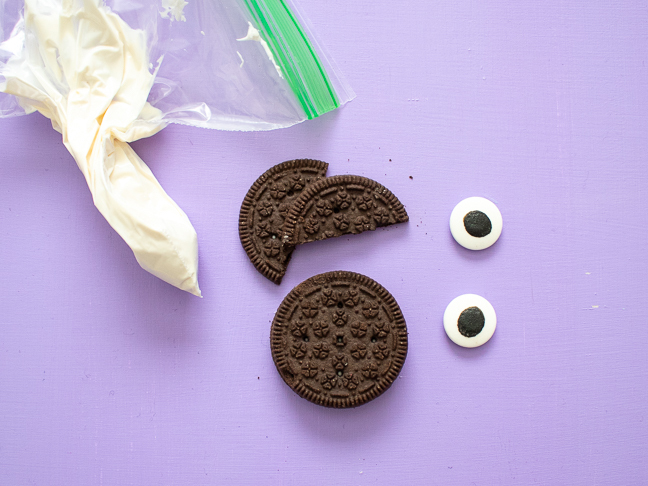 Step 2: Twist apart an Oreo cookie. Scrape away the filling from one side and carefully cut in half. These will be the wings. Step 3: Twist apart another cookie. 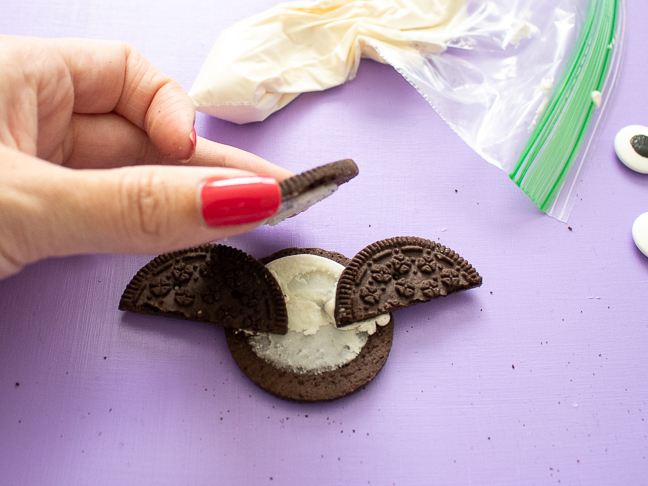 Use a little chocolate to stick the wings to both sides and place the other half of the cookie in top. The cream filling helps hold it all together. Step 4: Use the chocolate to glue on the candy eyes and dry little fangs. Add them to the top of the chocolatey cookies & cream cupcakes below for a fun Halloween treat! Step 1: Preheat the oven to 350 degrees and line a cupcake pan with Halloween-themed liners. Step 2: In one bowl, whisk together the flour, cocoa powder, baking soda and salt. In another, mix together the buttermilk and hot water. Step 3: Cream the softened butter and sugar until smooth. Add the egg and vanilla and mix for about 30 seconds. Step 5: Distribute the batter between the lined cupcake cavities and bake for about 18 minutes until an inserted toothpick comes out clean. Let cool completely before frosting. Step 1: Grind whole Oreo cookies in a food processor until finely ground. Set aside. Step 2: Beat the softened butter on medium speed until light and fluffy. Step 3: Gradually add the powdered sugar, scraping the bowl occasionally. Mix until desired sweetness is reached. Step 4: Add vanilla, then beat in the cookie crumbs until well-combined. Step 5: Pipe the frosting onto cooled cupcakes and top with additional cookie crumbs and a little bat for Halloween!